During 18 years of my parking and transportation career, I haven’t had an opportunity to call an office home. I started as a consultant for the state police and department of transportation, making recommendations about managing traffic and response during incidents and emergencies. Every day was a challenge, feeling like the person no one wanted around, but my job was critical to public safety. After a while, it became too much and I took a position at an institution managing transportation and parking operations. I joked in those days that I was qualified in transportation but parking just kind of came along with the job. My office was located in the public safety building for some time and then moved into an old house we shared with a food service vendor. After seven years there, I took a position at my alma mater, the University at Albany. 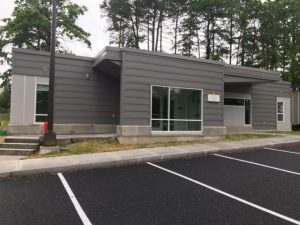 The office was in a construction trailer that was supposed to be temporary, but parking and mass transit services (PMTS) had been there more than 10 years. We had groundhogs living underneath the structure, a gravel driveway where we parked university vehicles, a back door that wasn’t locked—it was not pretty. During my second year, a project landed on the table to relocate PMTS to another trailer in the parking lot. By then, I had made many inroads about what parking is and how the department should be viewed. Based on those efforts, we were given a seat at the table. This was finally my chance to advocate for a new permanent facility—one we could be in for many years. We are no longer on the back burner. We are critical to events, advocates of facilitation, and pioneers in technology. I am happy to report that after two years of planning, construction, and meetings, we moved into our new building in early July. We finally have a place to call home. What a heartwarming story. Thanks for sharing and enjoy your beautiful new place!